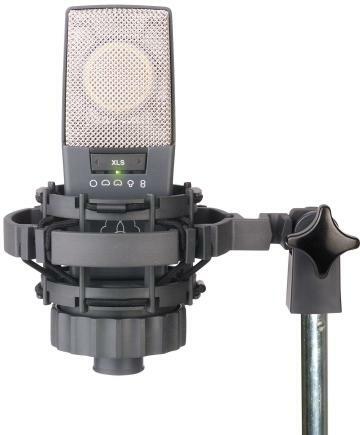 A studio standard and reference microphone for recording use, one of the most famous AKG microphones went through several engineering metamorphoses. Introduced in 1971 as the "C 414 comb", it was relaunched in 1976 as "C 414 EB", upgraded to digital-level performance as "C 414 EB P-48", conquered the installed sound market in its "C 414 B-ULS" version and the "C 414 B-TL II" became a favorite mic of studio engineers. The unmistakable twin-trapezoidal shape was often copied, and the unique sound and technology have remained unequaled. At Musikmesse /Prolight + Sound 2004 AKG uneveiled the C 414 B-XLS and C 414 B-XL II-taking this classic to the next level. The latest C 414 is slightly bigger than its predecessors, looking more elegant and stylish without denying its roots. The rounded edges also reduce undesired reflections. The rugged die-cast body is enameled in noble gray-blue. LED indicators inform the user about the operational status the microphone. The new models take the heritage of the prestigious C 414 line to state of the art technology based on advanced SMD componentry. A fifth polar pattern has been adde, besides cardioid, hypercardioid, figure eight and omni, the new generation also provides a wide cardioid. All switch positions, microphone output overload as well as power on/off status are indicated by LEDs. All function selectors are situated in the low-impedance section to prevent problems in highly humid environment. A capsule shock mount minimizes handling and stand-transmitted noise. Preattenuation is achieved by changing the polarization voltage. Further the latest generation of C 414 features a tight sensitivity tolerance of ±0.5%, higher sensitivity than on earlier models (+6 dB), 3 preattenuation pads (0 / -6 / - 12 / -18 dB), 3 highpass filters (0 / 40 / 80 / 160 Hz), low self-noise (6 dB-A), provision for remote control of all selectable functions . Remote control will be available in late 2004. Both X versions can be purchased as matched stereo pairs. Available models are the ultra-linear C 414 B-XLS and the transformerless C 414 B-XL II.